This article describes the steps to upgrade an existing installation of Enterprise Server 8 or Enterprise Server 9 to Enterprise Server 10.x. Before starting the upgrade, make a plan of what is needed: which features of Enterprise Server and its clients do you want to make use of and which additional (third-party) software does this require? What type of access do you want to give each user? Note: It is assumed here that any 3rd-party software is upgraded to a compatible version where needed and is fully working. Also read through the Release Notes to verify if any new features or changes affect your setup. Note: The following steps are needed if you want to migrate your existing data storage to the new version. If you have planned to create a brand new data store, these steps can be skipped. Step 1. Log out all users. Step 2. 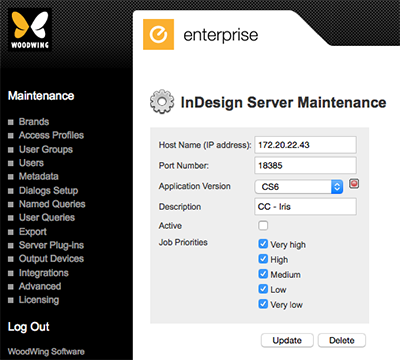 Wait until all running Enterprise jobs and InDesign Server jobs are completed. Step 3. Stop the Web server. Step 5. Stop InDesign Servers. Step 6. Create a backup of the database tables. Step 7. Create a backup of the File Store folder. Step 8. Create a backup of the Solr indexes. Caution: You must not just copy your old config.php file and configserver.php over the new one, as important modifications have been made which are necessary to run Enterprise. Caution: You must not just copy your old config_solr.php file over the new one, as important modifications have been made which are necessary to run Enterprise. Note: The remaining settings in this file are needed to fill the Solr environment with Enterprise data and to query these data. This should work out-of-the-box. Step 3. In Enterprise Server, run the Database Connection test on the Health Check page. If the database is not up-to-date, you are redirected to the Database - Installation / Upgrade page. Enterprise will automatically detect the current status of the installation and will list the necessary SQL scripts to run. Step 4. (Optional, only when directed to the Database - Installation / Upgrade page). Review the settings on the page and click Start. The SQL scripts are executed; Enterprise tables are altered and new tables are created. Because you are upgrading, data will be migrated as well. Each SQL command is echoed to your browser; in case any errors occur, these will be shown in red. After running the scripts, be sure to check for these red errors as they will almost always point out a significant problem, most likely to do with the configuration of either Enterprise or the database. Step 5. Return to the Health Check page and run the remaining tests. Resolve any conflicts that may arise. See Managing licenses in Enterprise Server 10. Step 1. In the Maintenance menu, click Integrations. A page showing links to integrated services appears. Step 3. Run an index on the Solr Search Server by clicking the Start button below the Indexing progress bar. The indexing process starts. Step 4. Optimize the Solr index by clicking the Start button located below the Optimizing bar. The available InDesign Server instances need to be verified in Enterprise. Step 1b. In the InDesign Server Jobs section, click InDesign Servers. The Overview of InDesign Servers page appears. Step 2. Click an already installed InDesign Server. Step 3. Verify that all settings are correct. Step 2. Log in using your admin credentials. Upgrade any layout templates or article templates to version CS6, CC 2014 or CC 2015. Note: Switching from the “old” environment to the “new “environment should be done when no user is logged in. Furthermore it is preferable that the “old’ environment is cleaned (for example: see if there are any objects which can be removed, and subsequently empty the Trash Can. For more information about cleaning up the system, see Deleting an Issue and Permanently deleting files from Enterprise Server 10). 27 September 2018: Updated section 'Before you start' with information about upgrading InDesign and InCopy.